Have you read Mackenzi Lee’s The Gentleman’s Guide to Vice and Virtue? If not, stop reading this review and go read that. This is the sequel, and both books are utterly delightful and disarming. This book is the second in The Montague Siblings series (or duology? there are only two of them) and the story belongs to Felicity, the more sensible and academic of the two. 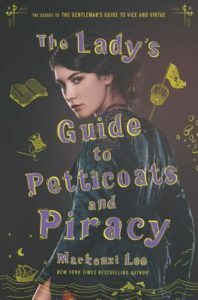 Gentleman’s Guide made it clear that Felicity has more interest in science and medicine than domesticity and society and in her book she leaves her negligent upper-crust parents behind to pursue a medical education. But it is the 18th century, so that’s easier said than done. After running into roadblock after roadblock by the men in charge, she comes into contact with a woman of questionable background who offers to pose as her maid and traverse the continent to Felicity’s medical idol Dr. Alexander Platt, who it’s said is less conventional and may have a spot for Felicity on his next exhibition. But it turns out no one is exactly as they have presented themselves, and everyone has their own surprising agenda. Once again, Felicity is pulled into a cross-continental chase in pursuit of adventure in order to avoid a return to her patriarchal home. As in the first novel, Lee infuses this historical romp with humor, social commentary, and just a touch of magic. Felicity is a more serious narrator than her impetuous brother, but her colorful supporting cast and sarcasm help keep things light. Modern feminist, sexuality, race, and gender issues are highlighted within the historical setting while also maintaining exciting action sequences, some nice twists, and complicated characters. I can’t recommend her work enough. Be prepared to stay up late for an extra chapter or two. Share the post "“If you can’t win the game, you have to cheat.”"